TANGO was never meant to fit, spatially and mentally, in a TOILET room, as an urinal was never meant to be an art object before it was placed in a gallery. As a kind of inverted Duchamp's "ready made" effect, Rodrigo Pardo brings the extraordinary into the ordinary creating an humorous and thought-provoking event of contrasted images. 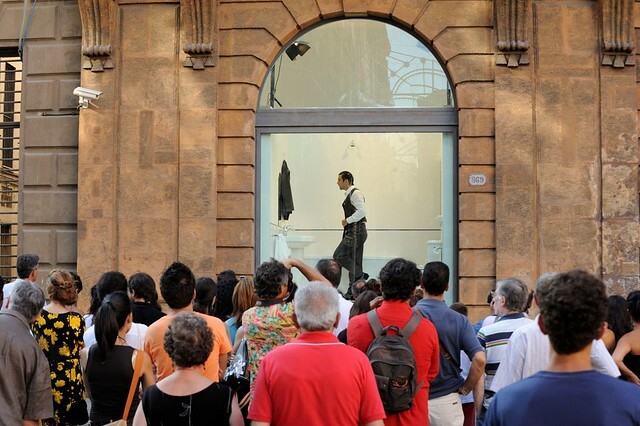 Usually performed in a shop’s window, it is physically placed in the border of the public and the private , a theater space gained from daily life that helps to reinforce the voyeuristic sensation given by the intimacy exposed. "With irony, elegance and eroticism Rodrigo Pardo revisits the traditional rite of the tango in a contemporary and conceptual way”. 15 Oct. 2008 - "The Guardian" ( Eng)"
-Joanne Mateer "the culture vulture"